We aren’t clowning around when we say that our Theme Wet Combo is the perfect addition to any backyard celebration! An enclosed entrance helps keep track of how many children are inside the moonwalk as well as a mesh-screened exterior to aid in adult supervision. 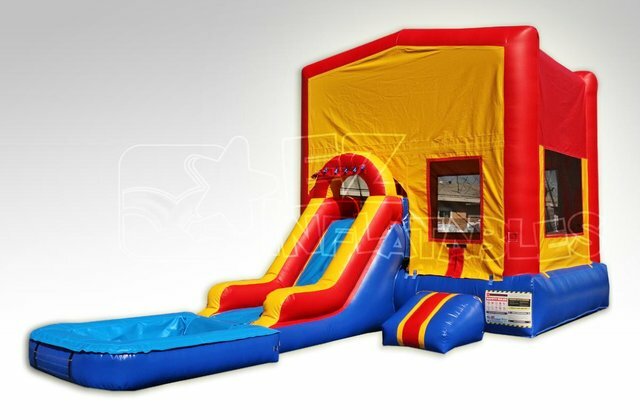 To add to this already exciting bounce house, hook a hose up to the slide and let riders enjoy a super-splashing water slide that drops them into the wading pool at the bottom. Jumping, bouncing, climbing and sliding, splish-splashing fun guaranteed!